There comes a time in every pet owner’s life when your cat or dog gets sick. When that time comes, it is important to get vet care for cats and dogs at a local veterinary clinic that you trust. Anchor Animal Hospital is a local Dartmouth vet hospital and clinic that provides a variety of care services, including emergency services, regular check-ups, veterinary treatments and much more. You can count on your Southeastern Massachusetts emergency vet to address your pet’s needs in a caring and professional manner. Most pet owners bring their dogs and cats to the local vet clinic for puppy and kitten shots, as well as boosters for rabies and other essential vaccinations. It is recommended that you bring your pets in for an annual preventative check-up, which can help to catch illnesses and disease before it becomes life threatening. In the case of an accident, illness or other urgent care situation, bring your pet to the local emergency veterinary hospital that has been serving South Coast residents since 1975. Similar to children who are unable to express how they are feeling at a young age, it is important for pet owners to learn the signs of sickness in their dogs and cats to ensure that they receive proper medical attention when it is needed. Many animals will instinctively try to mask any signs of illness. It goes back to that pack mentality when a sick or injured animal would be perceived as a weakness to the group and might be shunned, abandoned or attacked to preserve the safety of the pack as a whole. Certain symptoms require emergency vet care for cats and dogs more than others, however if your pet has any of the symptoms above, make sure to get them to the Dartmouth vet hospital within 24-48 hours to ensure that they receive proper care. If you aren’t sure whether or not a symptom requires attention at your emergency veterinary hospital or if it can wait for a scheduled appointment, go ahead and call Anchor Animal Hospital and ask to speak with one of our veterinarian team members. We can help you learn which signs and symptoms are urgent and which ones require attention, but not emergency services. Your veterinarian may require you to provide continued care and supervision for your pet following a visit to your local Southeastern Massachusetts emergency vet or veterinary clinic. For example, some illnesses or symptoms may require a change in diet and activity, while others may require medication or additional treatments. If you have any questions about the care that is being provided for your pet at the local veterinary clinic, make sure to ask during the office visit or call afterwards as issues or questions arise. Sick pets should be given a quiet space to recover from their illness or injury. Some pets will prefer to be left alone when sick, so it is important to keep small children and other pets away for at least the first few days. If special food is to be given, make sure to feed your pet away from the other pets in the household to ensure that it is eaten only by the sick or injured pet. It is also important to ensure that everyone in the house knows not to give treats or other food to the sick pet if they have been deemed potentially harmful by the vet. If your pet’s symptoms worsen or new symptoms arise following your visit, make sure to contact the clinic or emergency veterinary hospital right away. Any changes in your pet’s health could be a sign of a reaction to medication or new food, as well as a sign that the illness has become more serious. 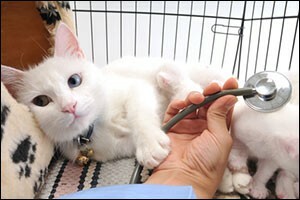 Either way, your vet needs to know about any changes that occur to provide proper vet care for cats and dogs. A new examination may be required, as well as changes in medication or diet, if needed. Even if your pet is not sick, it is important to have a veterinarian and local Dartmouth vet hospital that you can go to when you need it. Contact Anchor Animal Hospital by calling 508-996-3731 to find out more about our services or to learn about our emergency veterinary hospital hours. Our team provides vet care for cats and dogs, as well as a host of other common domesticated pets, to clients throughout South Mass and Rhode Island. Give us a call today and find out why so many locals call Anchor Animal Hospital their most trusted Southeastern Massachusetts emergency vet and clinic.